FOR OUR RESEARCH PURPOSES: WHAT IS REJUVENATION ENGINEERING™? NOTE: THE FOLLOWING ACT IS FOR OUR RESEARCH PURPOSES ONLY; IT IS NOT ADVISABLE FOR DRIVERS AND USERS OF RTR ENGINE TREATMENT BOOSTER OIL TO FOLLOW SUCH ACT. USERS ARE ADVISED TO MIX RTR ENGINE TREATMENT BOOSTER OIL WITH NEW ENGINE OIL AFTER EVERY OIL CHANGE. Thank you. When the mineral based engine oil reaches end of its lifespan, which is at 5,000km, the performance of the mineral based engine oil has deteriorated, and the quality of the oil has degraded as well. The engine performance had become sluggish and fuel consumption will increases as well. At this point, we added RTR Engine Treatment Booster Oil into the degraded/deteriorated mineral based engine oil and it had successfully rejuvenated the engine oil. As a result, the engine performance is also rejuvenated. That is why we named it Rejuvenation Engineering™. RTR (Real Torque Revolutionary) Oil Trading proudly presents the Modern Technology of Engine Lubricant, The RTR Engine Treatment Booster Oil. It is meant to be mixed with any ordinary mineral based engine oil and semi synthetic oil. It is the revolutionary breakthrough that matches the performance of the off the shelf fully synthetic engine oil. RTR Engine Treatment Booster Oil is a novelty and it is the first of its kind in the world. It is suitable for all types of engines, new and old; petrol and diesel; Forced Induction Engine and naturally aspirated. Get one bottle now and pour it into your engine and DRIVE TO DISCOVER. LET THE PERFORMANCE SPEAKS FOR ITSELF. 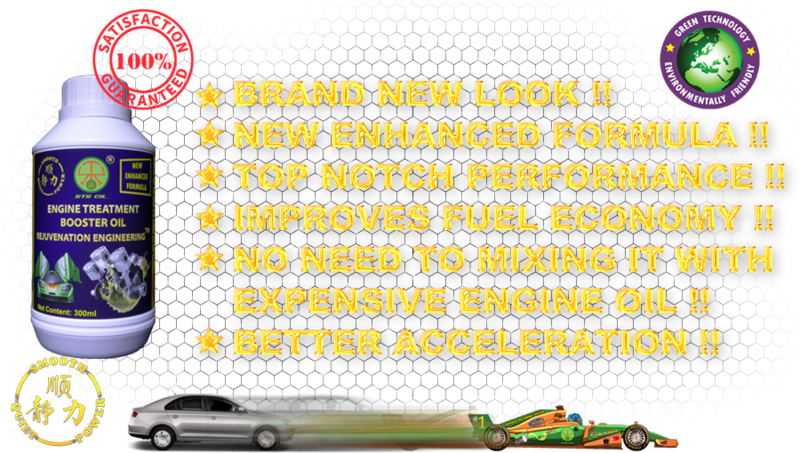 Please click on the FEATURES tab to explore more advantages after using our RTR Engine Treatment Booster Oil. For those who are driving Natural Gas Vehicles(NGV), they might have the advantage of fuel mileage. But they have sacrificed the engine responsiveness, horsepower and torque. To improve the engine responsiveness of NGVs, you should use RTR Engine Treatment Booster Oil to give your car a boost in engine responsiveness, horsepower and torque.